Supplementary material reads: "Gershon. City Desk. Illus. Daily. Around-world-cruise. Nos. 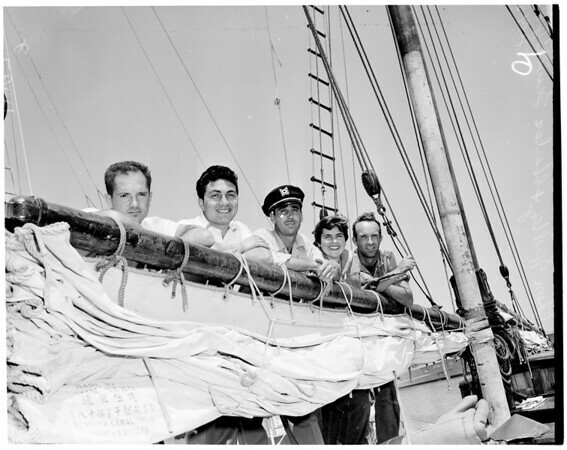 1/2: World adventurers, left to right: Arthur Stebbings 28, L.A., Richard Cassarino, 25, East Patterson, N.J., 'Capt.' Nat Gozzano, 36, Burbank, (he's owner), Lady (name, not a title) Weldon 'Bungy' Hedley, San Pedro, 19, and Charles W. Lewis, Jr., 27, Pottsville Penna., on schooner California. They'll go around world via Hawaiian South Seas. No. 3/4: Richard Cassarino, Arthur Stebbings, Charles Lewis, Jr., Lady (a name not a title) Weldon 'Bungy' Hedley and 'Capt. '-owner Nat Gozzano. 5/6/7/8: Schooner California getting under way from California Yacht Anchorage, San Pedro, for around-the-world cruise. Yacht is 63 feet long."